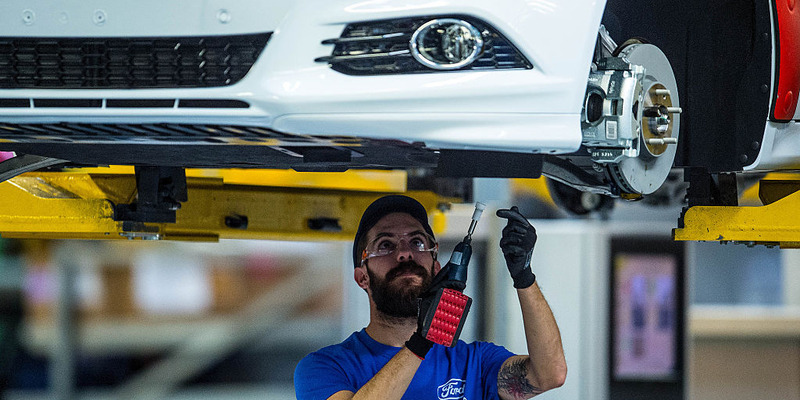 David Ramos/GettyAn employee works on Ford Mondeo vehicles on the production line during assembly at Ford plant in Almussafes on February 5, 2015 in Valencia, Spain. Goldman Sachs has upgraded Ford to ‘buy’ with a $US12 price target. Analyst David Tamberrino says a refreshed product line and cost improvement could lead to 30% gains. Ford jumped more than 6% following the upgrade – follow the stock live in real-time here. Goldman Sachs has upgraded Ford to a buy rating from neutral, with a $US12 price target that implies a potential 30% upside to the struggling automaker’s. “While we still expect a downward earnings trajectory into 2019 (North America profit under-pressure), we believe next year will represent trough earnings and the combination of a refreshed product cadence globally as well as cost improvements from strategic initiatives will begin to take hold,” David Tamberrino, Goldman’s automotive analyst, said in a note to clients Monday. Shares of Ford gained more than 6% in trading Friday following the upgrade from Goldman, though the sector at large was surging after a report from China’s National Development and Reform Commission proposed halving its tax on vehicles with smaller engines to revive the country’s struggling auto sector. 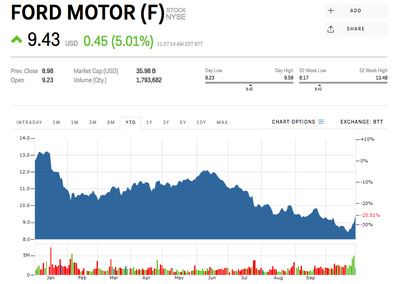 Ford’s stock price has fallen more than 50% over the past year as earnings continue to disappoint, but a global restructuring effort announced in earlier this month has helped reverse course. Those products could be similar to Ford’s move to focus on its F-series truck line by eliminating products like the Fusion midsize sedan, Taurus and Fiesta. The F-150 remains the best-selling vehicle in America and has been for 35 years. In September, the company announced an all-electric SUV that would rival Tesla. Goldman Sachs’ upgrade brings it into company with Wall Street’s most bullish analysts, JPMorgan and Jefferies, which both have $US13 price targets for the stock.